just took it out the pot and its got baby roots on so mabey I cud grow it to get it bigger for next yeat lol but how ? saw these today. They are really pretty. My mum bought a £10 one last year and after xmas she put it in the garden in the pot and it still looks great so she will be using it again this year. I bought the £3 one yesterday and put some small baubles and thin tinsel on it and it looks so cute hope i will also be able to re-use it next year. 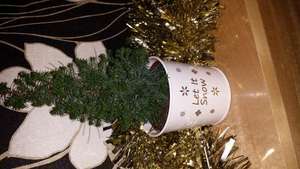 My mum bought a £10 one last year and after xmas she put it in the garden … My mum bought a £10 one last year and after xmas she put it in the garden in the pot and it still looks great so she will be using it again this year. I bought the £3 one yesterday and put some small baubles and thin tinsel on it and it looks so cute hope i will also be able to re-use it next year. Keep away from draughts and heat, Keep moist but avoid overwatering, water sparingly during winter and do not allow to dry out. Hope this helps. These were reduced to £1 yesterday so we brought a couple. How did people get on with growing it over the last 12 months? Really want to give it a go but not sure how to proceed. Keep indoors until spring?